Citizen Empowerment and Innovation in the Data-Rich City: (2017). Citizen Empowerment and Innovation in the Data-Rich City. Journal of Urban Technology: Vol. 24, No. 2, pp. 111-114. The cross-border relations between Galicia and northern Portugal have been shifting towards improved competitiveness, but also heading for the creation of stronger cooperation. However, it was only with the EU membership of Spain and Portugal (1986) that the foundation for successful cross-border cooperation was built. Constructing regional advantage in branding the cross-border Euroregion Galicia–northern Portugal: (2015). Constructing regional advantage in branding the cross-border Euroregion Galicia–northern Portugal. Regional Studies, Regional Science: Vol. 2, No. 1, pp. 341-349. Sustainable landscape planning in selected urban regions, edited by Makoto Yokohari, Akinobu Murakami, Yuji Hara, and Kazuaki Tsuchiya: (2017). Sustainable landscape planning in selected urban regions, edited by Makoto Yokohari, Akinobu Murakami, Yuji Hara, and Kazuaki Tsuchiya. Journal of Urban Affairs. Ahead of Print. 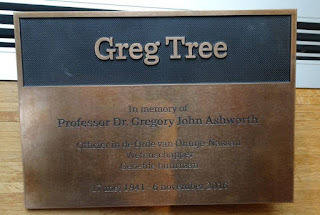 Last Saturday, a memorial tree was planted at the Martinikerkhof for professor Greg Ashworth, who passed away on November 6, 2016. Greg has lived at the Martinikerkhof for decades and was very loved within his neighbourhood. To fund the tree, neigbours have raised 2500 euro to be able to plant a large tree, a copper beech, which has been planted at the corner near the Gardepoort. These papers greatly highlight the most prominent gaps in the current understanding of flexible modes of governance within the emergence of new territorial settings, with a view to sketching out future research agendas built on the intellectual fissures of current practical and theoretical knowledge. The special issue involves six papers in which three specific knowledge lacunae are visible. The first is the emergence of new kinds of governance spaces dealing with this issue of fuzziness. Second, there is the emergence of a new setting of inter-territorial cooperation as flexible territorial-based governance arrangements. Finally, there is the emergence of new kinds of functionality regarding urban regions based on the labour market and home-to-work travel. Eduardo Oliveira is a Postdoctoral Researcher at the Swiss Federal Institute for Forest, Snow and Landscape Research WSL in Switzerland. At the WSL he devotes special attention to the effectiveness of territorial governance in strategic spatial planning and implementation as well as on the impacts of strategic spatial planning on urban land change. Eduardo has also been researching to what extent regional branding contributes to landscape conservation and new forms of environmental governance in and for urban regions.